I’m not sure how common it is to see glitter toes outside of the western states, but here in Utah it is practically all you see in the summer. I mean what’s not to like about them; they are all sparkle. As a cosmetologist I can tell you a trick to achieve look-a-like glitter toes without having to go pay someone every few weeks. Before I do that I first need to fill you in on what exactly are glitter toes. 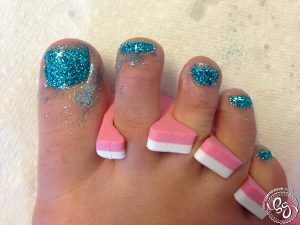 Glitter toes are basically acrylic or gel toes with glitter applied in between two layers of acrylic or gel. I personally don’t like acrylics or gels on my toes. I like to run and the moment those toenails grow out the slightest bit they smash and jam inside my running shoes, causing me great pain. The perk about them is that they do last until you soak them off or get them filled. They also won’t chip or peel off. My take on glitter toes is done with shellac or regular nail polish. This way I don’t worry about injuring my toes while running. I will tell you what I do step-by-step. Note: A few of the pictures are of my fingers. This is to show that this process can be done on either fingernails or toenails. Shape your nails. I use a very gentle nail file (220 or 240 grit) to just buff off the shine on the nails. Don’t file, just remove the shine. 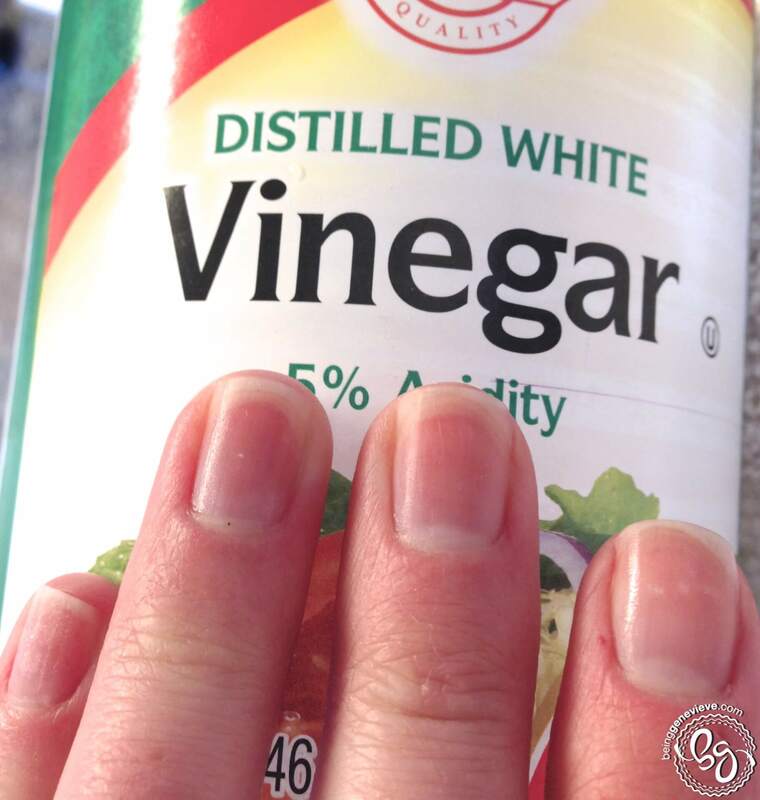 The natural shine on the nails, also known as natural oils, is what can cause your polish to lift or chip. Apply a pH balancer to dry out the nail to get it to the perfect pH level. This helps the polish to adhere and stick to the nail better. If you don’t have a pH balancer you can use vinegar. Note: I saw this tip on Pinterest and tried it out. It works well. Apply a layer of base coat, not top coat. Base coat has a property in it to help it act as a binder. It binds to the nail and then polish binds to the base coat. 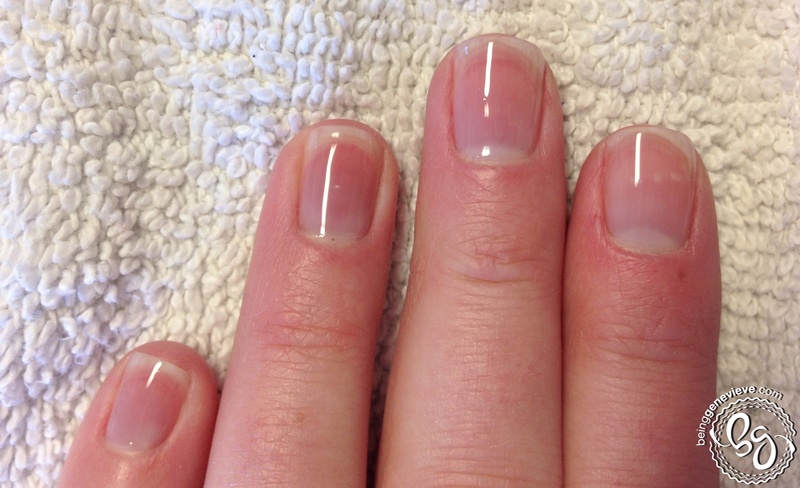 Shellac: Apply base coat and cure in CND light for 10 seconds. Apply a health amount of top coat to the dried base coat layer. Place a paper underneath your toes and sprinkle a super fine craft glitter to the wet top coat. Let the top coat polish dry slightly with the glitter on it. Gently tap your foot on the paper to remove excess glitter. Note: Do not push glitter into polish. This creates the glitter to look smashed on your nail and it loses some of it’s sparkle. Shellac: Apply top coat, sprinkle with glitter, and then cure in CND light for 2 minutes. I like this Martha Stewart craft glitter best. I found it at hobby lobby. You can buy it individually, in a pack of 6, pack of 12 or pack of 24. Now apply your top coat. Before re-dipping your brush into the polish, after each nail, make sure there isn’t any glitter on it. If there is, wipe it on a paper towel to remove the glitter. You don’t want to contaminate your polish. Don’t worry about the glitter around your nails. Once dry, it removes best if you just wash it off in the tub or sink. Shellac: Apply top coat and cure again in CND light for 2 minutes. Allow your polish to dry completely. Wash off the excess glitter from your toes under the tub or sink faucet. 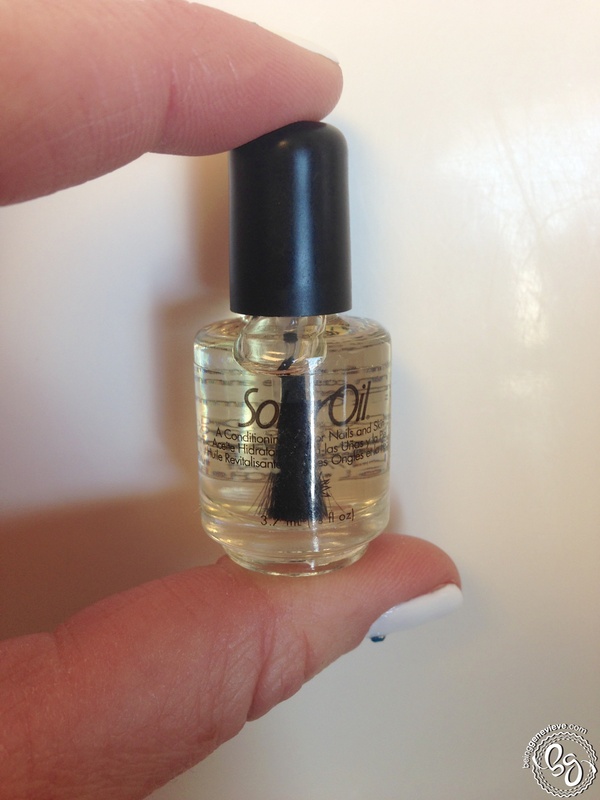 Then apply a cuticle oil just around your nails on the cuticle and rub into the skin. A cuticle oil helps condition your skin around the nails to prevent hangnails, which can occur after your nails have been done. 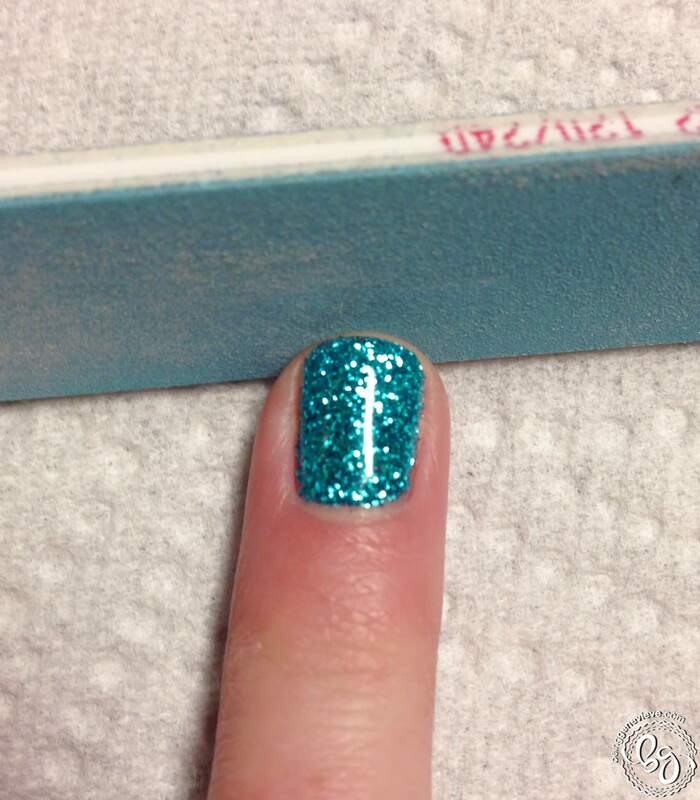 If once dry, you have a sharp glitter edge just use a gentle grit nail file to file the end. This will smooth the edge, but make sure the nails are COMPLETELY dry. 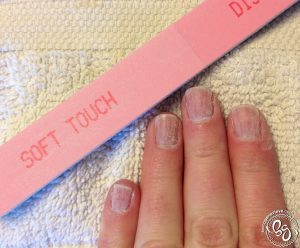 Shellac: Remove sticky residue on top of nails with a little polish remover. Wash nails and apply cuticle oil. You’re all done! It looks just like you have been to a spa and had your nails done professionally. I hope you enjoy your beautiful, super sparkly, glitter nails! Check back later on how to do the nail design, Baby, It’s Cold Outside, I have pictured below. Note: Gel polish needs to be removed after 2-3 weeks, check out Gel Polish Removal for the quickest, easiest and best way to remove gels. I Love this. I may just have to go get me some glitter today!! If you go to hobby lobby don’t forget to take a 40% off coupon code. The glitter is always full price. I got a uv light for Christmas! I bought some glitter today 🙂 I am excited to try this out! Have fun! Just a reminder, that with different UV lights the cure times vary. It worked perfectly! I did have to cure them a bit longer. It is still kind of bumpy, are yours smooth? Mine are smooth, but the CND shellac top coat is quite thick. You may need to do another top coat layer to fix the bumpy texture. 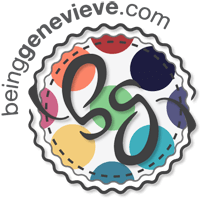 Hi, I love your website, just found it today! OK, 2 questions, so you put the gliter and cure it, then you put the top coat and cure it, those the gliter come off while applying the top coat? Also how do you remove this after two weeks? 1-Yes. Sprinkle with glitter and cure, then do top coat and cure again. Very few glitters may come off onto top coat brush. Before re-dipping into polish wipe glitter off onto clean paper towel (Step 6).